Chief Bouncer at Your Local Lounge? While my father had been sent to local Chinese schools, and failed, Uncle Jimmy had been sent off to elite boarding schools in England and failed, as well. Somehow, the family shoehorned Uncle Jimmy into Gordonstoun School in Scotland, the Alma Mater of Prince Charles. The chapter about Uncle Jimmy has been removed from the book, but you can read it (for free). Jackie Lee found alive after eleven years!!! Jehovah's Witness that the remains of a person are not important. and disappeared for 11 years with another woman. He has now returned to Singapore, and lives in public housing. He has also lost one leg to diabetes. A missing persons report for Jackie Lee (aka Lee Teng Jin) #CD/961222/68D, was filed with the Singapore Police (officer David Wong) on December 12, 1996. 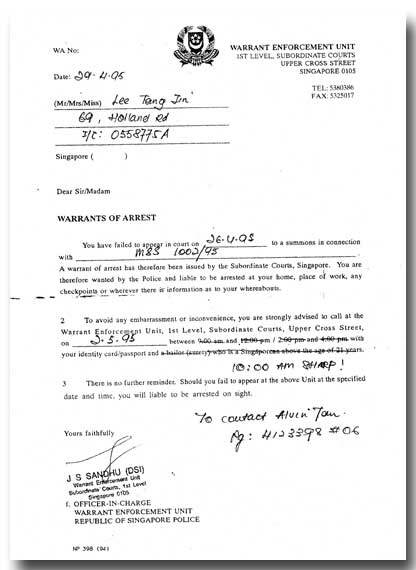 We later informed Ng Boon Gay of the Singapore Police that Henry Ang (I/C S1474466E), told us that his business partner, Chung Sue Sian disappeared at the same time as Jackie Lee. Chung Sue Sian, Jackie Lee's girlfriend owns or owned a flat at 230 Lor 8 Toa Payoh #06-175, Singapore. According to the Singapore Police, Jackie and his girlfriend fled to Kuala Lumpur. March 2002, Jackie Lee's lawyer wrote us: "I do not intend to alarm your wife but I must say that LTJ's sudden disappearance also seems a mystery to me." 9 July 9, 2005, Jackie Lee reappears in Singapore!!! November 2, 2005 Jackie Lee in Singapore Family Court (case MSS 1002/95) to face his ex-wife, Mabel! Jan 6, 2006, Lee Teng Jin's bankruptcy annulled by his making a deal with his former wife, Mabel. (PDF Document). girlfriend Chung Sue Sian to court over money. He is represented by Irving Choh of Rajah & Tann. Irving Choh was formerly with the defunct law firm, Chong Yeo & Partners. The hearing was scheduled for Thursday, 28th December 2006 at 10:00am. Chung Sue Sian is not represented by a lawyer -- in fact, there is no indication that she has even been located. Is Jackie Lee being taken for money by Irving Choh to sue a missing person? Irving Choh is not known for choosing the best clients. He is also defending Benjamin Koh, who advocated desecrating Islam's holy site of Mecca. An invitation to Al Qaeda to visit Singapore? Jackie Lee was born into wealth, grandson of Aw Boon Par, one of two brothers known as "The Tiger Balm Kings." He was raised in luxury in the family beach compound on Pasir Panjang Road in Singapore. Top Row: Jackie Lee, unknown, Datin Lee, the "White Monkey"
Spoiled, indulgent, calculating, but entertaining, he is one of the principal characters in Escape from Paradise. He mysteriously disappeared in 1995 with a ladyfriend named Chung Sue Sian. For eleven long years, not even the Singapore Police could find him. As a carryover from Pasir Panjang, my grandparents continued to pay all expenses for my parents, and for Uncle Jimmy. This included utilities, servants, drivers, everything, and jobs at Kong Kong’s bank. Poor fellows, how else could my father and Uncle Jimmy get a decent job without university degrees? Even in those days, education was important in Singapore. He took pleasure in pronouncing his new motto in life, “One wife and a million sweethearts.”Just about everyone knew about my father, and his apartment on River Valley Road. They knew about the madam, or mama-san, who would call him at the office, to tell him of new girls, so he could pile his friends into his car to go sample the latest arrivals for lunch. My brother Sam, being a boy, should have fared better, but he didn’t. Sam wasn’t my father’s type, and Hell was about to break loose for my brother. It was, as writers might say, that quiet time at afternoon’s end, when the tropical sun begins to fade sending yellow shafts of dimming light through the green vines clinging to my window, drawing fleeting shadows on the far wall of my bedroom. All of a sudden, there was a ruckus coming from my father’s room! Sam and my father were fighting! Sam was only fifteen, and slender, as a growing boy his age would naturally beno match for a two hundred and fifty pound thug. It was one of the most horrible sights I could ever see. Surprisingly, my mother stepped in and broke up the fight, apparently there were still some maternal instinct left. I thought that later, or the next day, Sam would return home, and that everything would be forgotten. Note: Later, Sam committed suicide.